Easy, creamy, delicious - are words closely associated with carbonara. 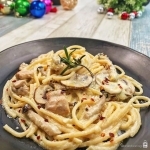 Very often, we get turn off by the thick and coarse texture of the cream sauce and always fail to finish a single plate of cheesy carbonara which is basically engulf with the taste of bacons rather than the goodness of cheese and mushrooms which are also ever-present yet seem to be the long forgotten cousin when cooked together with bacons. Our Share Food Home Cook, Judy, decides to ditch the unhealthy and salty bacon (sorry to the Meat Man) and instead focus on bringing out the essence of ingredients such as cheese and mushrooms which play a significant contribution to the overall taste of the dish and also introduces diced chicken to give an added texture to the pasta rather than using bacon, definitely an healthier option for sure. 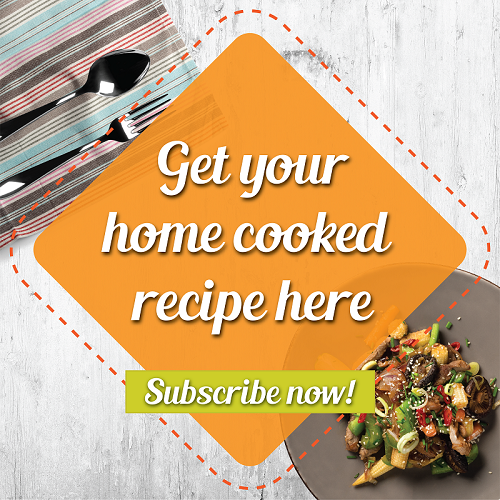 Be sure to try the Cheesy Carbonara with Mushroom and Chicken recipe and let us know how it went! Our Share Food Home Cook, Judy, decides to ditch the unhealthy and salty bacon, instead focus on bringing out the essence of ingredients such as cheese and mushrooms which play a significant contribution to the overall taste of the dish and also introduces diced chicken to give an added texture to the pasta rather than using bacon, definitely an healthier option for sure.